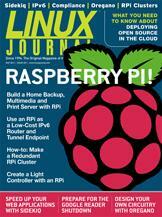 The low-cost, energy-efficient Raspberry Pi is an excellent choice for a home backup, multimedia and print server. Set up a Raspberry Pi as an IPv6 router and tunnel endpoint that you can use to provide IPv6 access to your home or office LAN. Take the stage like a pro with a Raspberry Pi light controller. Deploying open source to the cloud? This is what you need to know.